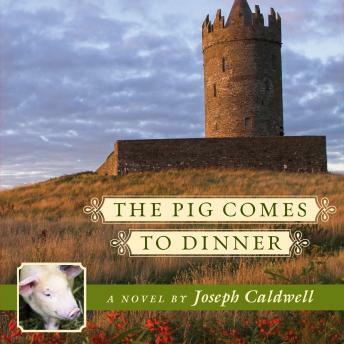 Enjoy a "second helping" from the obstreperous creature that romped so riotously through The Pig Did It with this sequel The Pig Came to Dinner. All of the charming characters of the previous story are also present again: Kitty McCloud and her new husband/former blood enemy Kieran Sweeney have bought an ancient Irish castle with the profits from Kitty's popular revisions of classic novels like Jane Eyre. Kitty's American cousin, Aaron McCloud, has arrived to visit with his new wife, the former swineherd Lolly McKeever. With them is a troublesome and unwelcome pig, a wedding gift they are redelivering to Kitty and Kieran. But over the resulting lighthearted discord hangs a weightier problem: Kitty's new home is inhabited by a pair of ghosts from out of the castle's troubled past. How this haunting couple is dealt with serves only to embellish the allure and humor of Mr. Caldwell's uniquely theatrical storytelling.